It's been two weeks, so now Miss Bean is officially allowed to mix with the kittens! Hooray! Awwwww those last 2 are so sweet! Enjoy your new charges, Nursemaid Beanie. Yay! Finally! Charlene does love the floofy boys the most, hey, Roland? And Edith looks thrilled to not be the only girl anymore. So sweet! 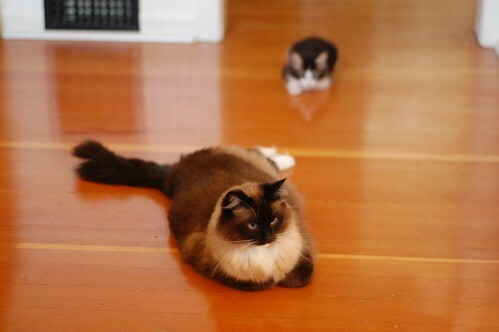 Pik 2: looks like Oliver is in pre-tail-pounce mode. Who can resist such a floofy lure? That's a whole lotta floof at one time! Pics 2&3 really show off young Curtis's floof wonderfully. They're all beautiful and adorable, of course, but I'm really quite taken with Curtis - I simply must have him. I'm in Montreal - that's kind of close to Seattle, right? I spy, with my little eye, a lesson about to be learned in picture 6! Curtis has the cutest, roundest, littlest, furriest face ever! I love all of them, but especially the last 2. The Bean is such a special cat eh Laurie? The Bean's expression in #2 just kills me. I adore her!! I'm making this my desktop background to make me smile through the day. All hail the Bean! 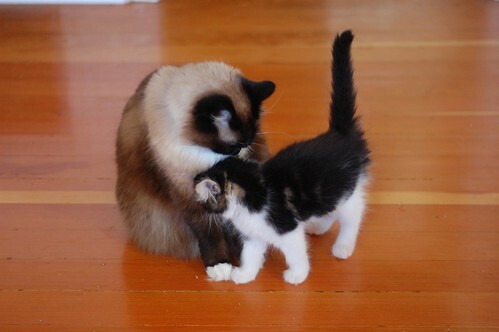 If only all of us could have a mother (cat) figure like this in our lives! Yay what a happy post! WE love that they are meeting - and oh those babies - I am in love with all of them! It just doesn't get any better than this (though I think that with each new litter)! In photos 2 and 3, it seems like the wee kitties are looking at the Bean in absolute awe and adoration. They are awed by her beauty and majesty! Adorable as always. Such sweetness on display here! I wonder how long it took The Bean to go from the kittens to the kitten food? If my soul is sore from talk of how the President handled "Mosque-gate", or the unemployment rate, or any other manner of problem, it is soothed by images of a beautiful kitten lovin' Momcat and her dear, inquisitive charges. 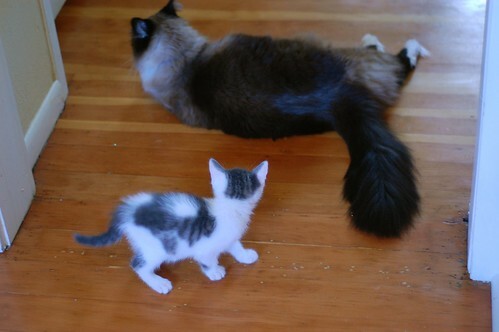 But don't touch the tail, kittens. Or the sparkle balls. I wonder if the fact that the kittens are closed off from her for two weeks is one of the reasons why she gets along so well with them. She wants to see them and the enforced delay just makes them seem more desirable? Bean is such a saint. And the looks on the kitten's faces in picture 3 is priceless. I loved the second picture where the Bean had just met the kitties and evidently already flipped one over. Too much! Curtis is so full of the cute! Laurie, does the Bean have lots of hairballs? She obviously has a lot of fur of her own to deal with and bathing every kitten in reach must result in a HUGE amount of hair in her digestive tract. I'm so excited that the babies are out of quarantine---kitteh skool starts now! 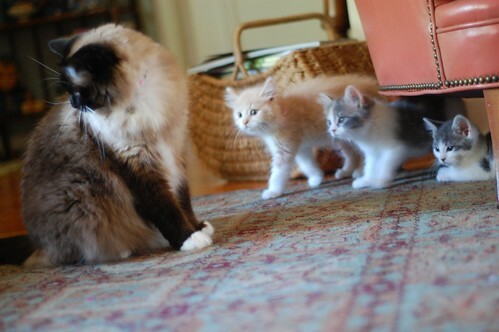 the curiosity of the kittens was totally captured in these wonderful pictures. Wait, "officially allowed"? Does that mean there were unofficial visits with the kittens, or more likely the kitten's food? She looks a bit overwhelmed but happy to have some kitty company again. The only thing I can think, after seeing Charlene's size next to the kittens, is: "That's a whole lot of cat." I love Curtis' face in Picture #2 -- he's all "Yikes!" Queen Bean totally cracks me up! 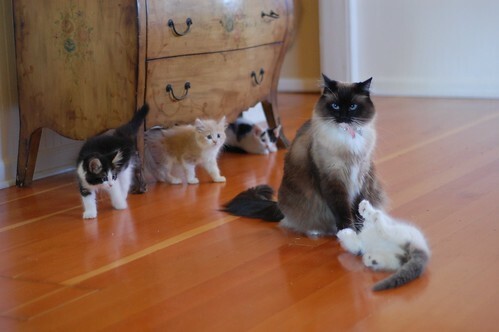 She is absolutely regal with the little ones, isn't she? 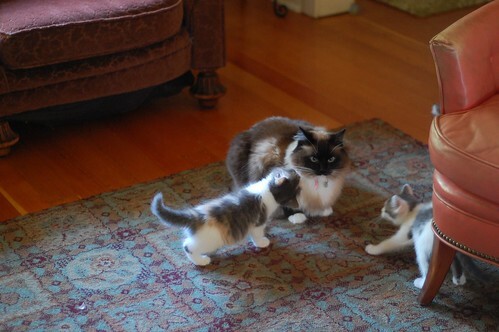 And, the babies are already enamored with her! In #3, you can almost hear those babies say "Who is this wonderful big kitty!" I know that Charlene loves those babies, but compared to them, she really is big! Have any of the kittens been afraid of her, or do they just know that she'll take care of them? Does the Bean ever get overwhelmed when she gets rushed by kittens? So much floof! So so sweet! 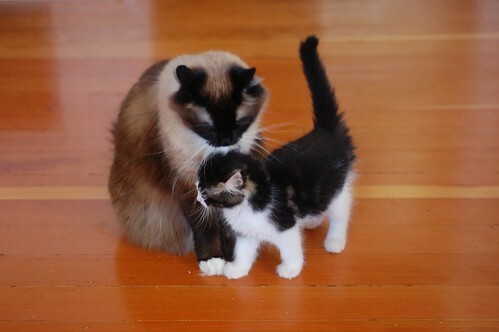 It fascinates me endlessly that Madame Butterbean tolerates-- nay, embraces!-- so many kittens so often. If my floofy girl-cat were confronted with five kittens (no matter how adorable) she'd be about six sizes bigger and bowling them over as quickly as possible. Thank goodness the Bean is so motherly. I too am curious how long it took for the Bean and the kitten food to meet! has charlene EVER met a kitten she didn't like? These pics filled us with love and joy today. Oceans - She rarely has hairballs. She'll cough up maybe one a year. Ruth - Yes, she does get overwhelmed at times. If she does, she'll usually jump up on the back of a chair or leave the scene. No hairballs from a long hair? My gracious? What do you feed her? I'm changing foods! Or how many hours of grooming do you do to keep those soggy messes from arriving, heralded by the dreaded "hork.....hoork....hrk...pftt"
Yay, Miss Bean and the babies get to be together now. 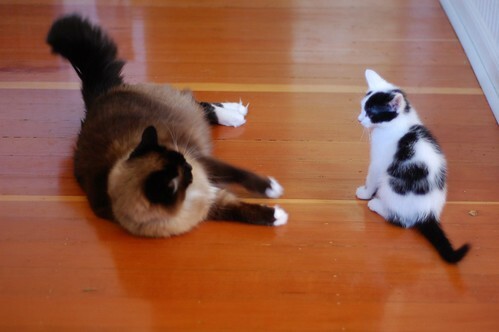 Love the stalking photo of Miss Bean and the one where she looks like she is giving Oliver some advice. The bean is such a good foster mommy. i love how they get so puffy when they first see her and how they are looking for love at the end.